What a beautiful effect. Looking forward to seeing more. I’m not a painter, but I find myself wondering about using that mix with a silk screen! Absolutely stunning. Thanks for posting this. Wow, this is stunningly beautiful – and you did this with bleach/sodium alginate???? Breathaking, no pun intended – lol. Okay, now I must give this technique a try. I’ve done the discharging with black fabric as well as various colors of fabric before, but only with bleach, no thickner. Also, seems every piece of black fab I get turns orangy, great if Halloween is my theme – lolol. Any suggestions on brand of black fabric that discharges nicely to shades of white. Just love your piece here – thank you so much for sharing! Thank you for your kind comments. 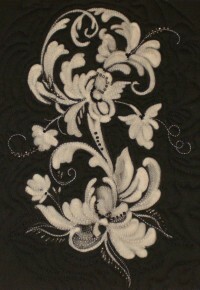 To answer your questions: I bought black cotton sateen from JoAnn’s but it was a few years ago. I would try it again though, just an 1/8th yard. I rely on my grocery store to provide fresh chlorine bleach but if I have had a bottle hanging around I give it the smell test. Just a tiny whiff will give you a pungent order that you can’t stand. If it smells weak, it is. I have had some (after quite a while) that has no smell at all. Throw it out. You mention rinsing your finished product in vinegar. This is not an effective way of getting rid of bleach. You need a product called anti-clor. You can buy something similar in Walmarts in the fish department where it is put into fish tanks to get rid of any chlorine in tap water. Rinse your fabric well first, then immerse it in bucket of water that you’ve added a few drops of the anticlor and let soak for a short while. Your painting skills are incredible. Even using your technique, I’d never do that. But will file the info for some more random type painting.